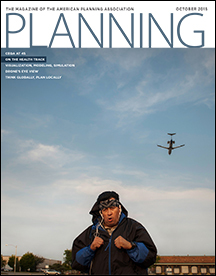 The American Planning Association has released a report that I co-authored with Kendra L. Smith. Data sets are growing so large and complex that using them is like drinking from a fire hose. Feeling overwhelmed? Help is on the way. 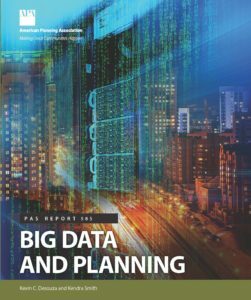 Big data isn’t the problem; it’s the solution — and this PAS Report shows how to use it. 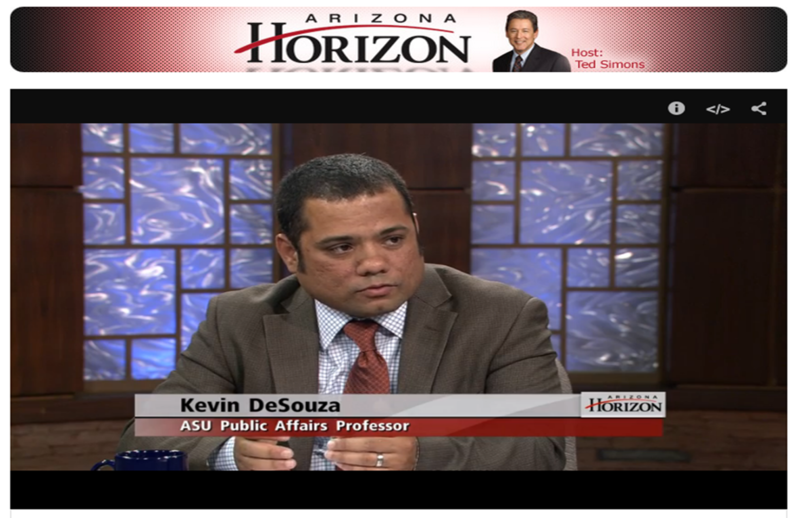 Arizona State University researchers Kevin C. Desouza and Kendra L. Smith have teamed up on a practical guide to channeling the power of big data. Together they look at how planners around the world are turning big data into real answers for smart cities. Learn how Dublin is gearing up geospatial data to steer traffic. See how Singapore is collecting citizens’ selfies to track smog. Discover how Detroit is crowdsourcing creative ideas for its 50-year plan. 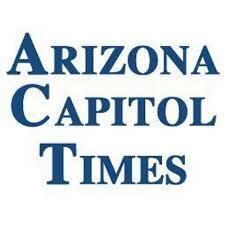 And find out how the U.S. government is planning to use Yelp to improve its services. What’s the big idea for your community? Read Big Data and Planning for a look at trends and tools you can tap into today. I published a new article in Slate for their Futurography series on the challenges cities might face when self-driving cars share the roads with old school vehicles. Can Self-Driving Cars Share the Road With Old-School Vehicles? I was also interviewed for a story in Wired on the US Department of Transportation's Smart City Challenge. Will be heading to Michigan later this month to keynote the 2016 Technology Forum. How can we harness data towards innovative local governance that advances our communities? Today, we have all heard about open data, mobile data, and even big (and very big) data. We have also seen a rise in civic hackathons, competitions, and challenges that engage innovators to solve complex problems and promote the use of data analytics for global development. In this presentation, I will use a wide assortment of cases to illustrate a key point, i.e., while we have made great strides in leveraging technology and data, we have undermined its potential due to an under-appreciation of governance and policy nuances. Do not despair! I will outline a series of actionable steps that can be undertaken to rectify this deficiency. Specifically, I will focus on how can we create data-driven development labs to tackle some of our most vexing social and policy challenges. WHERE: Ottawa County Fillmore Complex, West Olive, MI (Map). Enter parking lot B, forum is in main conference room of the County Administration building, second floor, west wing. Looking forward to visiting the University of Washington later this month. I will deliver a research presentation at the Evans School of Public Policy and Governance. I was on the faculty of the University of Washington Information School from 2005-2011 and held adjunct appointments in the College of Engineering and the Evans School. Information systems are fundamentally transforming how we manage public institutions and conduct public policy. 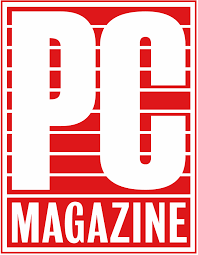 Yet, even a causal glance at the mainstream public management and public policy research outlets reflects a glaring omission of serious research into information systems when it comes to their design, management, governance, and evaluation. This state of affairs is not acceptable given the critical nature of information systems and their potential to impact how we govern. Consider several recent incidents: the FBI agitating Apple to unlock the mobile phone of one of the San Bernardino attackers; questions over regulation related to drones or the sharing economy; the Cybersecurity National Action Plan and new measures to protect critical infrastructure in the wake of growing cyberattacks; effective deployment of complex information systems such as healthcare.gov; and ethical and control questions related to big data and predictive analytics. These are just a handful of information system disruptions transforming public management and public policy. As investment in information technologies and the policies, programs, and services they enable, continues to rise, we desperately need active engagement by public policy and management scholars. Drawing on over three years of research in both traditional and emerging information systems, I will highlight opportunities to fill this gap and advance the management and impact of information systems. It has been a while since I updated my blog. Here is a run down of the main things I have worked on over the last two months. 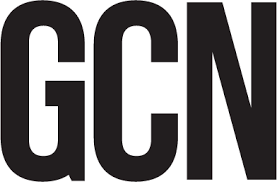 Creating a Balanced Portfolio of Information Technology Metrics was the most downloaded report published by the IBM Center for the Business of Government for 2015. I joined the ICMA's Performance Management Advisory Committee for a two-year term beginning on Jan 1, 2016. It has been a busy and productive 2015. Best wishes to you and your families for a peaceful and prosperous 2016. 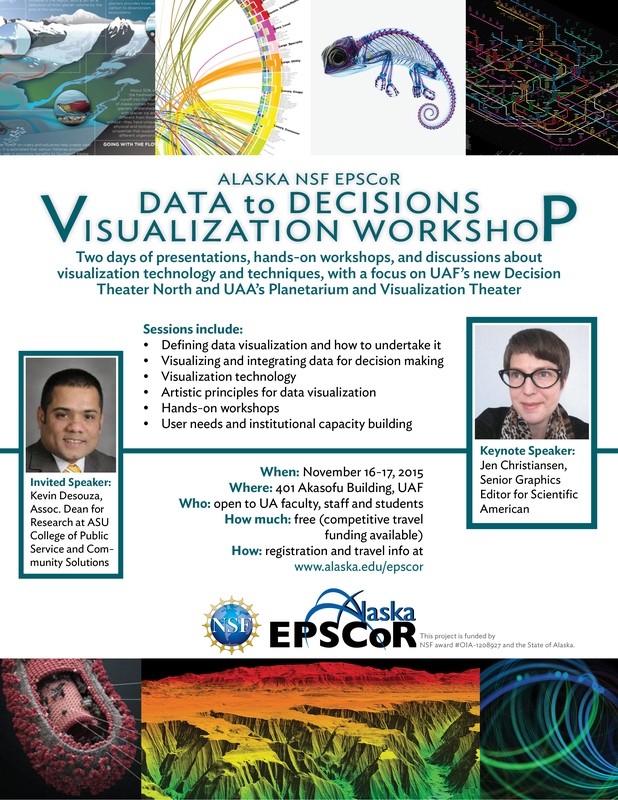 Heading to the University of Alaska Fairbanks today to deliver a talk at the Data to Decisions Visualization Workshop hosted by the NSF Sponsored Alaska EPSCoR (Experimental Program to Stimulate Competitive Research) program. 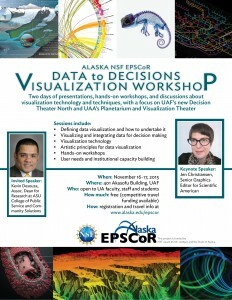 In this talk, I will highlight how technologies enable us to visualize policy options and simulate scenarios. Technologies, however, are no panacea when it comes to policy design and implementation. Deliberate decisions need to be made on how to structure the technology-enabled policy simulations to arrive at evidence-driven policy design, implementation, and evaluation. Please click here for my slides. I am enjoying two weeks in Melbourne. I have been collaborating with colleagues from Deakin University and the University of Melbourne on research projects. On Tuesday, I will deliver a research seminar at the Faculty of Business and Law on IT Experiments for Social and Policy Innovation: A Design Science Perspective. Information systems are critical assets that need to be strategically leveraged for social and policy innovation. In this presentation, I will highlight ongoing research projects showcasing how analytical, computational, and visualization technologies can be employed to solve some of the pressing global and public challenges from combating human trafficking to urbanization and sustainability. I will discuss these projects as learning experiments focusing on creating applied IT solutions while furthering evidence-driven policy design, implementation, and evaluation. Finally, a design-science inspired model to co-create innovative IT solutions will be presented. On Wednesday, I will be spending the entire day meeting with researchers and faculty at the University of Melbourne. 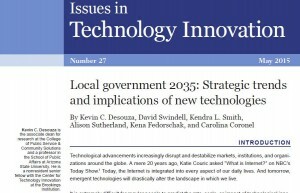 Today, the Brookings Institution released the Local Government 2035: Strategic Trends and Implications of New Technologies paper as part of the Issues in Technology Innovation series. Technological change is increasingly disruptive and destabilizing. In order to maintain effective governance systems, public sector entities must overcome stagnant tendencies and take a proactive stance—acting in the face of impending technological innovations. Future government entities must evolve into lean, responsive, and adaptive organizations capable of rapid response to societal shifts. In this paper, we illustrate how technological advancements, such as the proliferation of drone technologies, artificial intelligence, autonomous vehicles, and peer-2-peer services, will introduce data privatization challenges and destabilize existing governance systems. In order to maintain effective service delivery, public sector entities must increasingly consider the ramifications technology will have on income inequality, fragile and conflict states, and immigration—just to name a few. They conclude by urging policymakers and government managers to chart out trends based on data, model the interactions within complex systems, and study the pathways towards outcomes to unearth intended and unintended consequences of strategic choices. The authors argue that designing a path forward for local governments will require deliberate collaboration among diverse stakeholders, an immersive engagement with the data and scenarios that will shape local communities, and employment of decision-tools to model and simulate alternatives.